Custard creams are my absolute favourite classic biscuit so I thought it was about time I attempted to bake my very own. 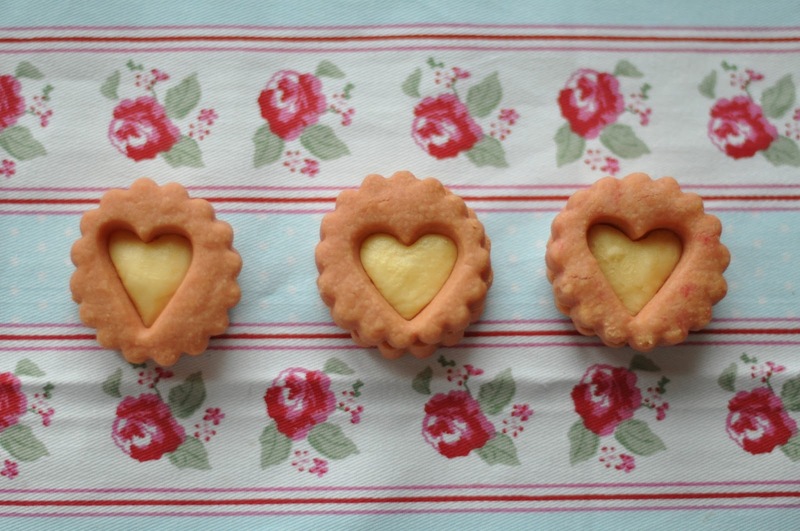 I found the recipe for these on Edd Kimber's blog and gave them a little Sophie twist...hearts and pink biscuit dough! Makes 16 - 20 biscuits. Pulse the flour, custard powder and icing sugar in a mixer until well combined. Add in the butter, food colouring and vanilla extract and continue to pulse until the mixture begins to come together. (At this stage my biscuit dough looked more like breadcrumbs, so I took the dough out of the mixer and kneaded). Wrap the dough in cling film and chill for 30 minutes in the fridge until firm. Roll out the dough on a well floured surface and roll to a thickness of 3-4mm. Cut the biscuits with a small round cutter and place on a lined baking tray. I halved the biscuits between two baking trays. One with plain round biscuits and the other with a heart shaped centre cut out. Chill for a further 15 minutes. Whilst the biscuits are chilling, preheat the oven to 180 degrees. Bake for 12 minutes, or until golden. Its quite important to keep an eye on the biscuits, I found that the tray with heart centres was done by 8 minutes so took that one out early. To make the custard filling, beat the butter in a bowl until light and creamy. Approximately 5 minutes. Slowly incorporate the icing sugar and custard powder and continue to beat until smooth. I found the custard filling to be quite firm so used a teaspoon to sandwich the two biscuits together. The dough is quite short so the biscuits have a shortbread type of texture. I think I'd change the recipe slightly so that they're more crisp than crumbly. I'm not sure if adding a little more butter would work? Ah Sophie these look so cute! 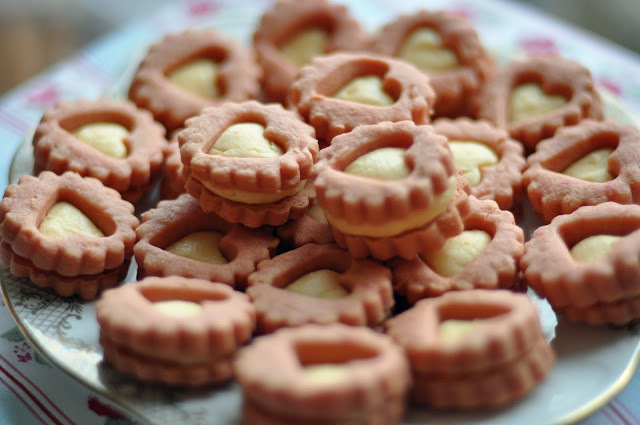 A lot of people seem to like Jo Wheatley's recipe for custard creams in 'A Passion for Baking'. I haven't tried it but might be worth a go? If you haven't got it, the book is a pretty good all-rounder. This is such a cute way to adapt the recipe, they look so tasty!